Sometimes it's great just to have fun with a sheet of stickers. In this layout I used just a few colours of cardstock and some playful stickers to create a fun background for my photos. It's a great technique for completing a fast page or putting a page together with your kids! 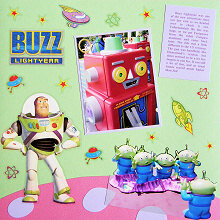 This layout was created using three colours of Bazzill cardstock (green, pink and purple) and Sandylion Buzz Lightyear stickers. Use the green Bazzill cardstock as your background. Cut a circular shape out of the pink Bazzill cardstock to create your planet and adhere it to the bottom of your page. Cut out a handful of roundish shapes from the purple Bazzill cardstock and adhere haphazardly on the pink cardstock to give your planet character. Place the large Buzz Lightyear sticker on the left side of your page so that he is standing on the planet. Cut out one of your photos around the central character/s (for me it is the aliens) and adhere in the bottom right corner of your page so that the character is also standing on the planet. Mat another photo with purple Bazzill cardstock and adhere at an angle in the middle of your page. Add journaling to a piece of purple Bazzill cardstock and adhere at an angle in the top right corner of your page, as shown in the layout above. Finally, decorate the rest of the page with the remainder of your stickers, as shown in the layout above. Please note that one of the reasons this page works is the nature of the stickers. They are mostly stars and spaceships - items that are intended to be in space and not anchored to other elements of your page.